I was super excited to see Seekers of the Sun selling at the Clothes Show Live last week, so it was only right to buy two sets for £15, especially when the retail from £13-18 per set. 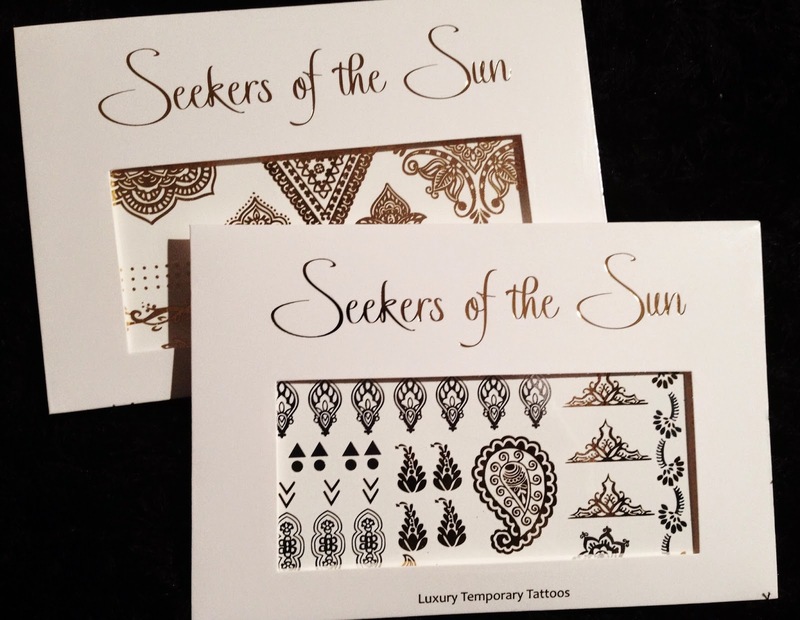 To those of you who don’t know, Seekers of the Sun are a luxury temporary adornment tattoo brand who specialise in unique patterns to help you express your style and mood. The unique brand has featured in Company Magazine and worn by Beyonce, amongst many others. So, here are my thoughts. In preparation for my birthday, on Thursday night I put on five individual finger tattoos; baring in mind the website says that these luxury tattoos last up to a week and I was told they last from 3-4 days. I woke up to find barely visible gold marks, disappointed, I applied three other finger designs. While getting ready, one design smudged and by the time I reached sixth form – around 3 hours after applying the tattoos – two of the three designs were also barely visible. Whether, I performed activities that were so intense that it would cause what should have last up to a week tattoos to last no more than 4 hours, I was extremely saddened. These luxury tattoo designs are beyond gorgeous and as I do love a good henna design, having gold inspired designs surely means a win situation, right? But Seekers of the Sun may have found it a good idea to warn customers that the finger detail set will last much less than said or than the others, if the case is that the majority of the tattoos last up to a week. I want to hear your views, so, if you have used any of the tattoos by Seekers of the Sun, please leave a comment below on your experience. I would love to know whether you think they are good value for money, how long yours lasted and would you purchase them again? Of course, if you haven’t used them before, I still want to know your opinion. Please leave a comment on whether you would purchase them and if you think they are good value for money. £13 for a tattoo that last a few hours… I’m not convinced.